McMahan is well-known for his foundational work in The Making of Buddhist Modernism (Oxford University Press, 2008) in which he describes how both Asian and Western interpreters have shaped Buddhist discourse over the last two centuries. Buddhism in the Modern World explores the challenges faced by Buddhism today, the distinctive forms that it has taken and the individuals and movements that have shaped it. Each chapter is written by a distinguished scholar in the field and includes photographs, summaries, discussion points and suggestions for further reading. The book provides a lively and up-to-date overview that is indispensable for both students and scholars of Buddhism. Two IBS faculty members have also contributed to this volume. Dean Richard K. Payne contributes a chapter on Buddhism and psychology. In “Buddhism and the Powers of the Mind,” Dean Payne discusses the ways in which modern Buddhism and modern Western psychology arose within a similar cultural-historical milieu thus leading to the perceived similarities between the two traditions. Prof. Scott A. Mitchell contributes a chapter devoted to pop-cultural representations of Buddhism, discussing the ways in which Buddhism is expressed within and is co-opted by mass media. 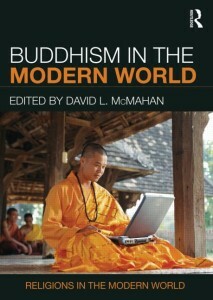 Buddhism in the Modern World is available in paperback directly from the Routledge website.